Extreme ultraviolet Imaging Telescope (EIT) 304Å image of a pair of similarly shaped prominences from 11 January 1998. A collage of prominences, which are huge clouds of relatively cool dense plasma suspended in the Sun's hot, thin corona. At times, they can erupt, escaping the Sun's atmosphere. 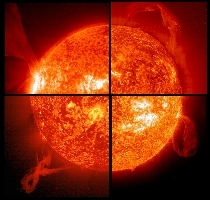 For all four images, emission in this spectral line of EIT 304Å shows the upper chromosphere at a temperature of about 60,000 degrees K. The hottest areas appear almost white, while the darker red areas indicate cooler temperatures. Going clockwise from the upper left, the images are from: 15 May 2001; 28 March 2000; 18 January 2000, and 2 February 2001.